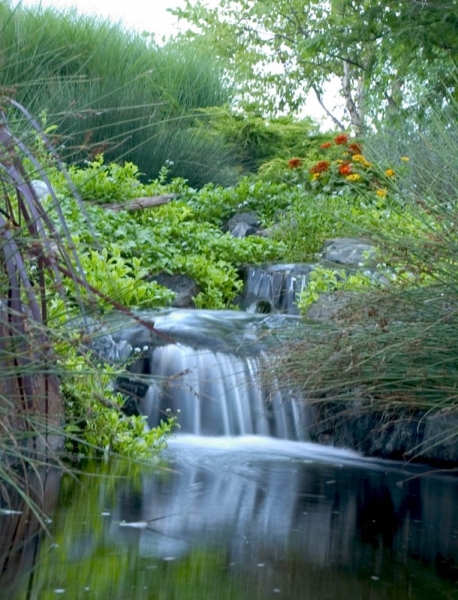 Inventor of the low-maintenance ecosystem pond, which is the # 1 contractor-installed water garden. Products are field-tested before going to market. Professionally-installed and do-it-yourself water feature products are available. Environmental Design) certification for its corporate headquarters. Premium products in consumer-friendly packaging with complete installation instructions. Ongoing field and research development to bring the best quality products to market. Residential and commercial applications are available, from the smallest water feature to the most advanced. Character – We believe in integrity, honesty, and a high moral standard which includes doing the right thing at all times. Team – We recognize that the organization is more important than any one individual, thinking of others instead of ourselves. We believe in communicating a trusting, thoughtful, controlled, and consistent message. Win – We believe in doing our best and seeking ways to improve ourselves in an attempt to find the win-win resolution to every situations. We strive to be easy to do business with, striking a balance of winning for customers, teammates, the company, and shareholders. Fun – We believe in working hard and playing hard through safe, clean, family-friendly and wholesome activities. Our goal is to continue to make Aquascape a great place to work! Aquascape’s vision focuses on an ecosystem approach to water features that relies on the most natural balance of circulation, filtration, plants, fish, and rocks and gravel to ensure sustainability. As a natural evolution, Aquascape strengthens and cultivates its commitment to the environment and the responsible use of water. Water is our planet’s greatest resource and Aquascape is dedicated to providing natural, responsible, and creative landscape solutions. In 2008 we focused on a business strategy that is fully committed to environmental sustainability. In addition to our ecosystem pond philosophy, Aquascape extols the therapeutic benefits of the water gardening lifestyle and current research confirms and strengthens that position. Mainstream organizations embrace Aquascape’s ecosystem philosophy. Aquascape currently provides ecological solutions for wetland restoration and storm water management in numerous locations, and is poised to further expand its environmental position through new product development initiatives. New product development remains at the forefront of Aquascape’s environmental and business strategy. Environmentally-focused, innovative products are currently being developed and tested. The intelligent use of water is being addressed so companies and consumers alike can face challenges associated with drought and rain water run-off. Healthiest Companies in America – 2015, 2016, 2017: Aquascape was recognized for achieving exceptional participation rates and health improvements through workplace wellness initiatives. Silver-Level LEED® Certification: Aquascape’s company headquarters, dubbed “Aqualand,” received a Silver-Level LEED® (Leadership in Energy and Environmental Design) rating from the U.S. Green Building Council (www.usgbc.org) in 2006. Best Bosses Award 2005, Winning Workplaces: CEO Greg Wittstock was named one of the Best Bosses for 2005, according to FORTUNE Small Business Magazine in conjunction with Winning Workplaces. Visit the Winning Workplaces website to read Greg’s Success Story. 2004 Ernst and Young Entrepreneur of the Year Award: In 2004, CEO Greg Wittstock was a nominee for the 2004 Ernst and Young Entrepreneur of the Year Award. Crain’s List of Chicago’s Largest Privately Held Companies: With annual sales topping $58 million in 2007, the company appeared at number 316 on the April 2008 list in Crain’s Chicago Business, a regional business newspaper. Follow Aquascape on our social media platforms and subscribe to our monthly e-newsletter.